Tony Durkin had heard nothing but rave reviews of Paradise Palms until he jumped on the iseekgolf website. To his surprise the celebrated NQ course was being pummeled by some critics, so he decided to carry out his own test run. 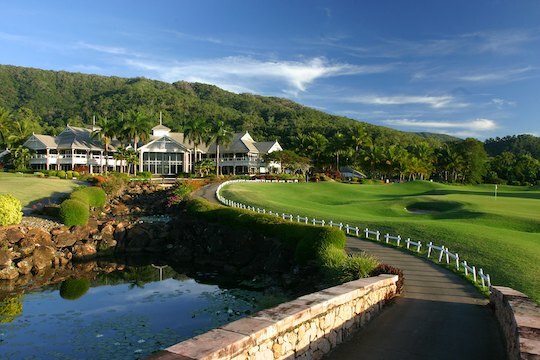 Since it opened two decades ago, Paradise Palms Country Club in Queensland’s deep north has been consistently rated in the top 50 Australian golf courses. In fact back in 2003 it was ranked the 9th best public course in the country. And in its current state this golf course lives up to that reputation. It is, in every sense, a beautiful golf course and an exacting challenge of the ancient game. But unfortunately that is not the impression gleaned by scanning the reviews on iseekgolf.com. Clearly two years or so ago the condition of Paradise Palms left much to be desired and many reviews reflect the poor condition of the course – most notably the tees and the greens. Sadly, many of those severely critical reviews remain on the iseekgolf website. On a recent visit to Palm Cove I took the opportunity to gauge for myself why so many golfers (not on websites) had raved about Paradise Palms. The general consensus was that while it was long and generally unforgiving, playing ‘The Palms’ would be an unforgettable experience. And following a triple bogey on the opening par five, my immediate reaction was exactly that, albeit for the conflicting reason. But I digress. Regrettably my visit to Paradise Palms Country Club, just north of Cairns, coincided with an unseasonal wet period and carts were permitted only on the paths. And, as most golfers would attest, there are not too many more frustrating ways to navigate a golf course. The course was saturated, and while that made the greens extremely receptive to my approach shots (not normally the case), run on the fairways (something I need) was non-existent. But those weather-induced negatives aside, Paradise Palms was everything I had anticipated. For the average golfer not one hole on this course could be considered a ‘gimme’ to par, and anyone playing to their handicap has good reason to feel pumped. While using driver is often fraught with danger here, it is a necessary gamble from the back markers (6394 metres). Strategic and accurate tee shots are essential on many of the demanding par fours, with the dogleg fifth a graphic case in point. In fact the stretch of five, six and seven is as a good a test of golf in consecutive holes as I have played. Because of a creek that meanders through the course, the par four sixth – rated No.1 on the course – calls for accuracy from the tee in both direction and length. The same precision is required for a mid-to-long iron approach to a smallish and undulating green that is cunningly bunkered at the front. Tagged Paradise Palms’ signature hole, the par three seventh is a little ripper. An extremely challenging 174 metres from the white markers, there is absolutely no room for error with water on the right and at the front, plus a bunker short left. I can modestly report that both my son Mark and I managed two-putt pars on this picturesque par three. Eighteen could also be considered a signature hole. For a first timer this par five (438 metres from the whites) is very confusing and the best bet is play safe along the fairway. But for long hitters prepared to take on Mt Fuji (the highest part of the course I would suggest), it is very much an eagle chance. My other favourite hole was the par-five 10th – a lengthy 500 metres from the whites and the longest hole on the course. Water protects the entire length of the fairway on the right and everything on the left feeds down to the lake. The tee shot is blind, with two bunkers sitting around 200 metres from the tee, so accuracy with driver is essential. Precision is again needed to keep the second in play and a precise short iron to an elevated green completes an especially-rewarding golfing experience. My par here was the highlight of my round, in which I played six over my handicap yet walked off thoroughly satisfied with that score on what could to me is an extremely difficult golf course. The course guide is an absolute must for those playing Paradise Palms for the first time. It is easy to follow and accurate – so take note of the warnings. Director of Golf, Des Shearer, is an affable bloke and after being there five years seems to have put his stamp on the course. He says most fairways have recently been ‘widened’ – by judicious mowing – because he didn’t believe visitors had to be ‘beaten up’. However, anyone who does enjoy confrontation should head to Paradise Palms in May each year for the Blue Tee Challenge. The two-day event, which kicks off the golf season, is usually won by anyone who can shoot two rounds in the low 80s. From my experience I would suggest the days of the uncomplimentary reviews of Paradise Palms are over. Membership is on the increase – only 45% of players are now visitors – three coaches are employed and Paradise Palms is the home of the North Queensland Academy of Golf. And, course designer Graham Marsh had been working on plans to lengthen the course by about 300 metres. Now that will be a challenge.